CSIRO have just published a new Sustainable Ecosystems handbook on sustainability of native pastures. 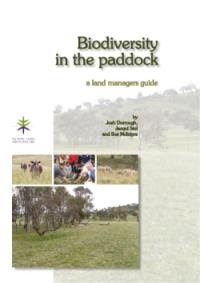 Biodiversity in the Paddock (PDF, 4MB), is a practical field guide to help graziers and land managers achieve biodiversity outcomes alongside the utilisation of native pastures. (30 pages). There is growing interest in the role of native pastures in landscape health and biodiversity conservation... read more.